Keynotes play a predominant role in business. Even big tech giants like Apple and Google use keynote presentation for their conference and product launch. If you are in search of modern and creative free keynote templates like the big corporates use, well, you are at the right place. 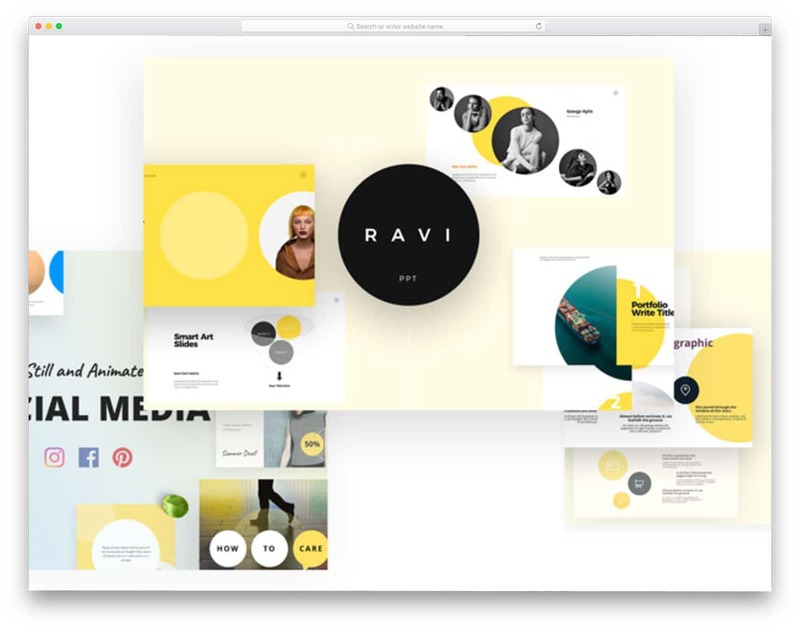 In this free keynote templates list, we have collected some of the best templates with interactive design. Designing a slide is the most difficult part of the presentation. We are very much limited with space, of course, we can add as much as slides as we want. But when you add more slides, your presentation becomes boring. The points in the slides are to be crystal clear and the important points must be highlighted. 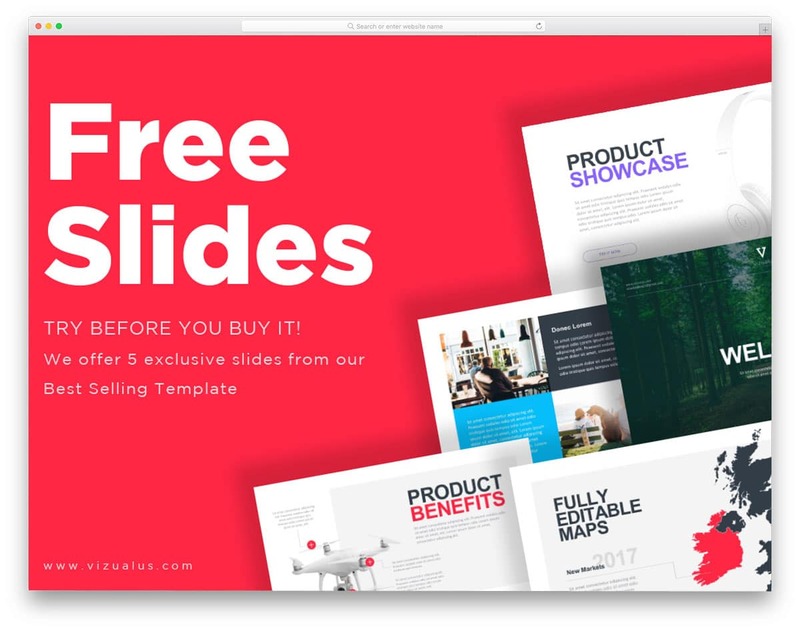 The free keynote templates mentioned in this list use interactive design to help you engage audience easily. Animation effects in the slides have improved a lot, we are getting more lively effects nowadays. Since all these free keynote templates are created for the generic purpose, most of them won’t use animation effects. To make your customization work simpler we have also mentioned some of the best free tools like Canva to create interactive slides. 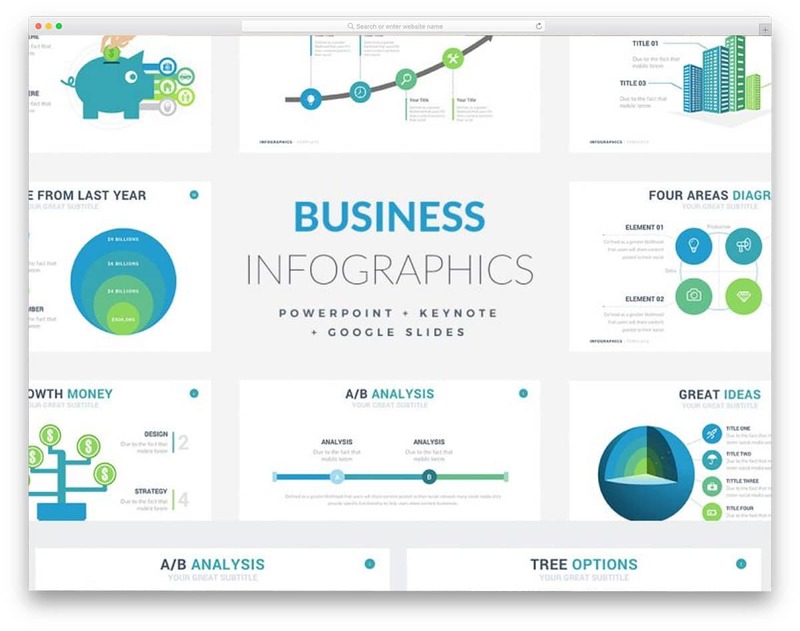 Using this tool you can customize and create the templates online and can download them as images and add to your slides. Saying that let us get into the list of free keynote templates. Making an impressive pitch deck is a crucial one to convince your investors. Showing where you are now & where you will be after a few years, and how much you have grown all these years, will help you give a clear insight into your business. 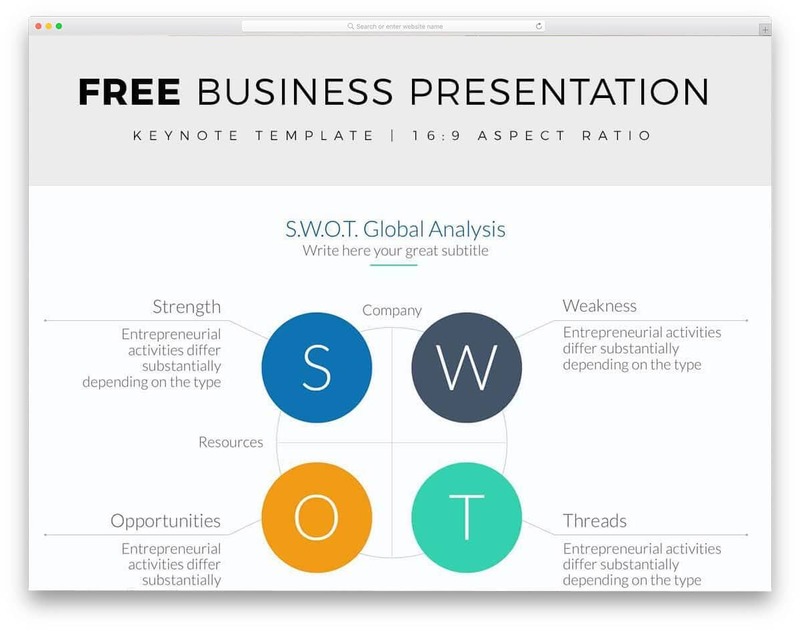 This free keynote template will help you give a proper insight with an impressive design. All the basic elements are given in this pitch deck design, hence you easily start with this design and add the elements you need as you move forward. A simple clean minimal design is followed in all the slides, so the audience can easily see and interact with the contents on the slide. Giving a clear cut idea to your team will help you and your employees to stay on the same page. 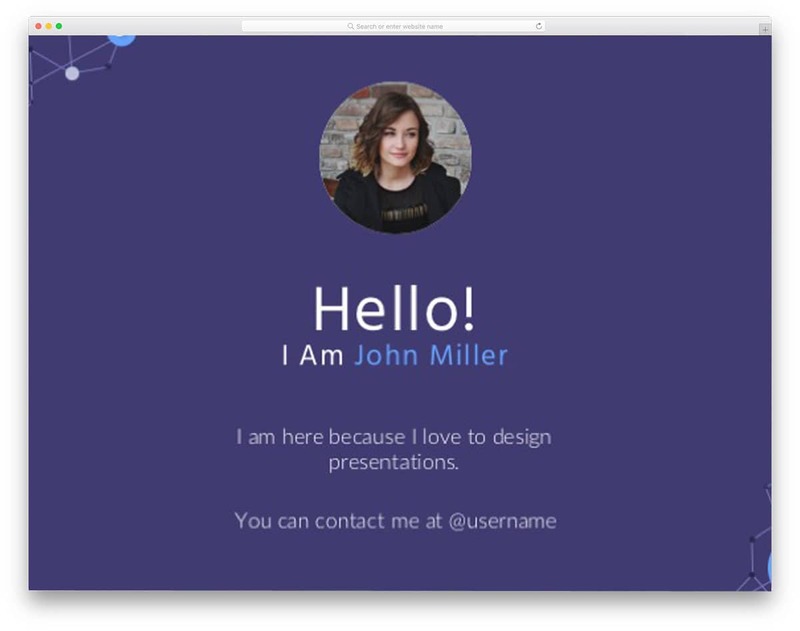 Using a smart keynote template like this will help you get an even better result. The designer of this template has given you all basic elements to present the content engagingly to the audience. Ample amount of space is given for both texts and images hence you can keep your audience engaged throughout your presentation. Since it is a free template, you get only a handful of slides pre-designed for you. 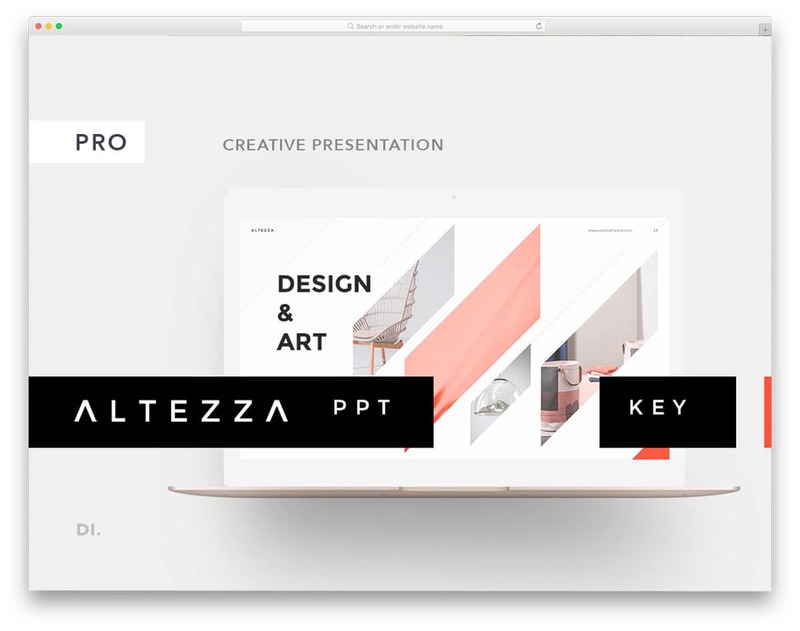 Altezza is the best creative keynote template for architects and interior decorators. The minimal design of this template helps you to highlight the contents easily. Both images and text contents are given equal importance in this template so that you can explain your projects clearly to the users. Since this template is designed for creative minds, it includes many creative elements. Texts are made bigger and bold so that audience at the longer distance can also clearly see your texts and read it. More than 100 slides are included in this template and all of it follows the same clean minimal design. With all these slides you can start and complete a presentation work in no time. Shape Shift is full of geometric shape rich keynote template. Using geometric shapes in the design is the modern design trend and you can see it many trendy new websites. With the help of the geometric shapes, you can turn the spotlight on the important contents in your slide. It not only makes your slide unique but also helps the user to clearly focus on the important contents. Many vector icons and Google fonts are used in this template to help you present the contents engagingly to the users. The designer of this template has used nearly 40 colors and you have an infinite amount of options to customize these keynote templates. Every is a modish looking multipurpose keynote template. If you want to make a clean presentation by keeping your contents at the center, then this template is the best option for you. With lots of white space, this template use only a handful of elements to give a distraction-free environment for the users. The designer has also included few elements in this template to make your presentation engaging to the users. On the clean slides, the texts are bold and easy to read. More than enough space is given for the text contents to help you explain the project in detail to the slide. The Every template is the best option for business presentations. Space is from the creators of the Shape Shift template mentioned above. You can expect the same design quality and perfection with this template as well. Since it is a freemium template, you get a pixel perfect design with a restricted amount of elements. You get the basic elements, but if you need a complete set, you have to go for the premium version. The designer of this template has used trendy stylish looking form. Texts are professional and easy to read so you need to worry about readability issues with this template. Since this template is designed for professional use, light colors are used. Minimal, as the name implies this template is designed with a minimal look. With pitch-black texts and pristine white background, the users can clearly understand your contents. This one is a very formal type, so you can’t expect any creative stuff with this template. Lots of text space is given in all the slides to let you explain your presentation in detail to the users. The distraction-free environment on the slide let the audience to grasp your points easily. Again this template is an ideal one for business presentations. The creator of this template has made customizations easy so you won’t find difficult to work with this template. 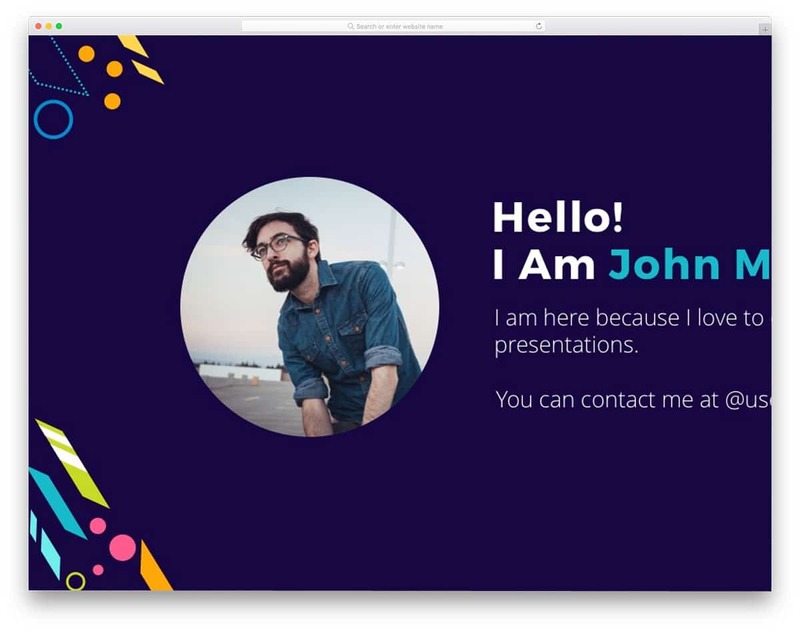 Zane is a professional looking modern creative keynote template. With the industrial grade design, this template fits well with all types of business and personal presentation works. The designer of this template used modern design aesthetics to meet present-day audience taste. Just like in the premium templates, this one also uses high-quality images and easy to edit vectors. 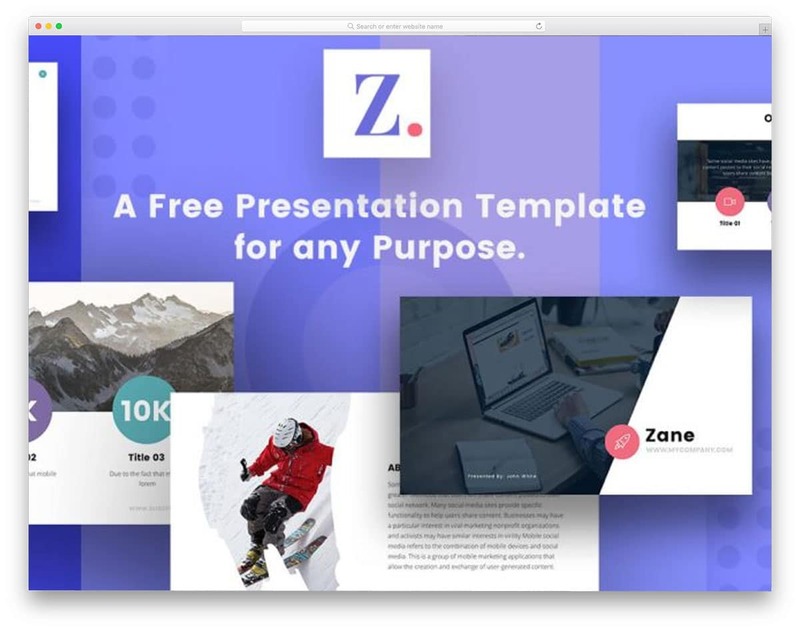 With the Zane template package, you get eleven pre-made slides, all of them follows the same clean design that presents your content elegantly to the audience. Sice all the design part is already taken care, all you have to do is to add your contents. If you are searching slides to share stats and analytics rich topics, then the Presentation is the best option for you. One of the biggest challenges in making data and stats rich presentation is, you have to make your slides engaging for the users. In order to help you present all your stats neatly and interactively to the users, this template provides you a number of editable vectors. This template uses usual 4:3 layout size slides, so you can use it for any general purpose. Another advantage of this template is it comes in two version, light and dark. 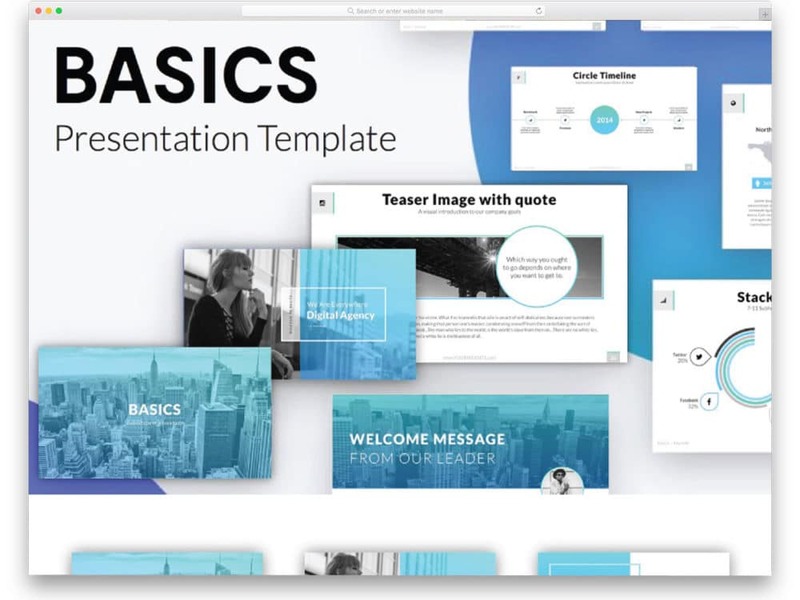 As a package this template also comes with powerpoint presentation slides, hence it is useful for both mac and windows users. Sella is a business class keynote template, designed like a modern website. Major design aspect of any business website is to let the user explore the site without any difficulty, all the contents must be easily accessible and must promote your business genuinely. The Sella keynote template is designed based on these principles. The designer of this template has made use of the colors and design elements smartly so that you can present your product elegantly to the audience. With this template, you get five unique pre-made slides, with full customization options. 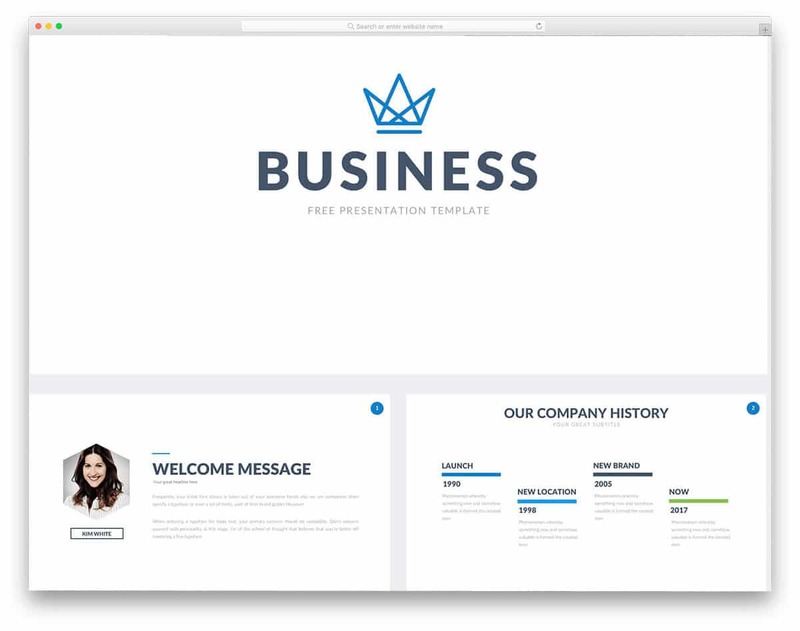 Business, as the name implies it is a perfect keynote template for business presentation. Right from the fonts to the color scheme used, the designer of this template maintained a professional look so that you can use this template for multiple types of business purposes. By default, this template uses a clean white background, but you also get some slides with an image background. The fonts are big and easy to read, so even the last audience can read the text easily. In this bundle, you get ten pre-designed slides. Talking about the slides, this template uses 16:9 widescreen layout so that you have more than enough space to add all your contents. An image worths thousand words, within given time and space we have to deliver all the important key points to the audience. Images are the best tool to achieve both of the points mentioned. 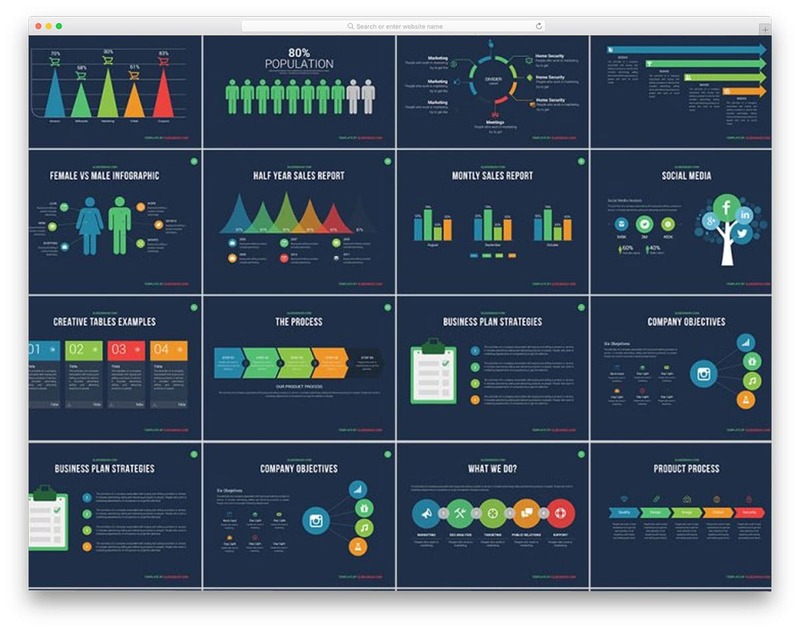 Infographic for Keynote is a collection of 600 slide templates that includes editable vector elements. With this package, you get all types of interactive elements to present your stats and data elegantly to the users. The creator of this template generously gave us this valuable template for free with lots of useful elements. You can use this template package as a collection and can use it in other keynote presentations as well. Social media is a modern creative corporate style template. The layout of the template is flexible, so you can use it for other purposes as well. With this template, you can demonstrate stats and you also can explain your strategy and your next goals. Since this template is designed based on social media theme, you get plenty of chat bubbles and interaction like elements. The slides give you both clean solid color backgrounds and image backgrounds. The title headings are bold and easy to read, but the subtitle texts are very smaller. 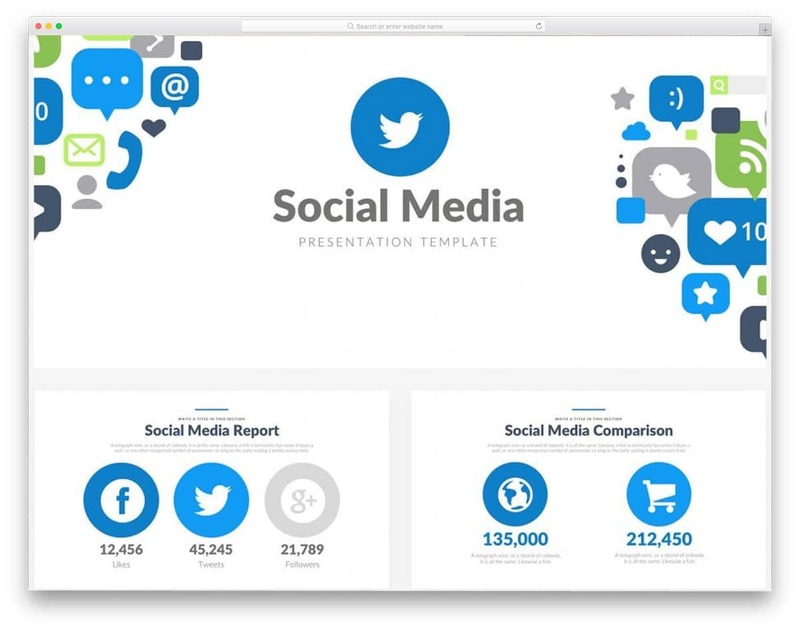 If you are going to use this template, this might be the thing you need to change, other than that the Social media free keynote template is easy to use and the best in its class. Creative Keynote, as the name implies it is a creative style template. Geometric shapes designs are increasing nowadays, even big tech giants like Google and Microsoft are using these style slides in their conferences. With the present-day tools you can create any shapes easily and can give them more lively colors, but they will take time. The creative Keynote template saves your time by providing those interactive shapes as editable elements to you. 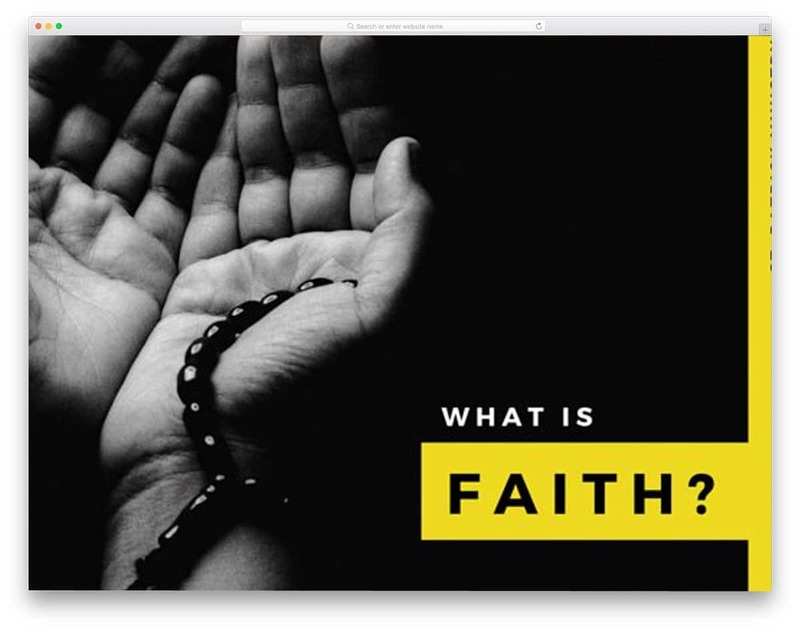 Slides in this template use both plain background and image background to help you make the presentation interactive. As a package, this template gives you twenty-five unique slides, all of them has 16:9 aspect ratio, widescreen layout. Simple minimal, as the name implies it is a minimal template. As with all other minimal templates, this one also follows a clean white background with bold texts. The slides in this template package have designs for both casual as well as business presentations. To match the minimal look of the template line icons are used. The slides are designed like sections in websites, so you get a more interactive design with this template. With the simple design, you can concentrate more on your contents and also can present it elegantly to the users. 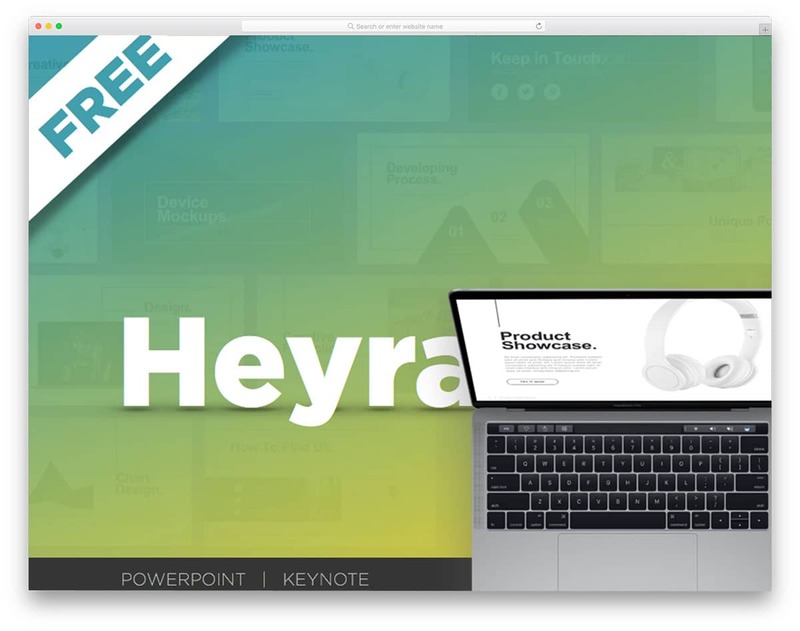 Heyra is another minimal design based business presentation website template. 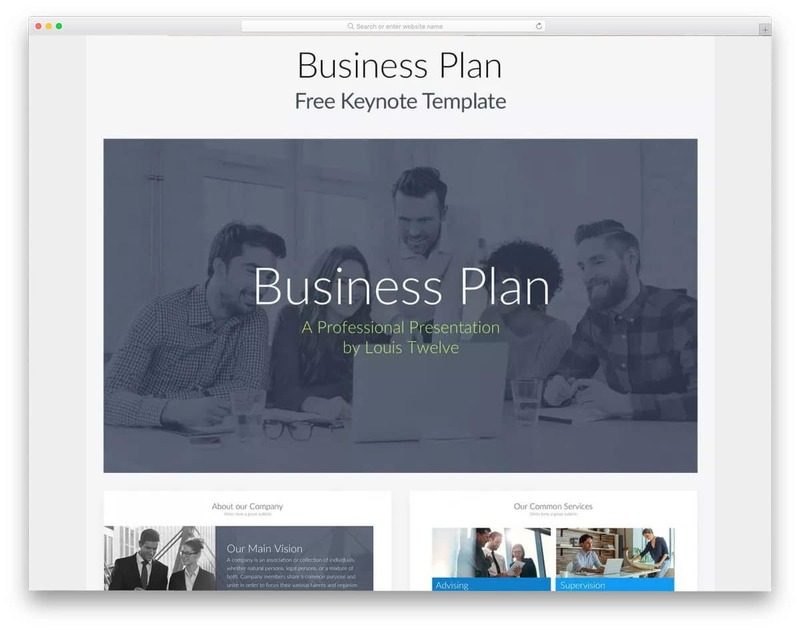 With the high-quality images and icons, this template becomes one of the best free keynote templates. Just like the Sella template mentioned above, this one also follows similar website based design, in fact, this template is also from the same creators of the Sella template. Other useful elements you get with this free keynote templates are editable maps, handmade maps, and twelve unique slides. All the twelve slides are made extremely easy to edit format, all you have to do is to replace the existing content with your own contents and images. Social Media Keynote is also a social media based keynote template just like the Social media template mentioned above. But this template follows completely a different design. This template concentrates more on the stats with a minimal design approach. In its design, the template has many colorful presentation elements, which looks attractive and visually appealing on the clean white background. The fonts are also big and bold enough to read. Instead of using same old dumb design, this template uses many creative designs to keep the audience engaged. Mockups are also included in this template package to help you create contents in no time. As a whole, this template is worth downloading and will also help you with many future presentations. 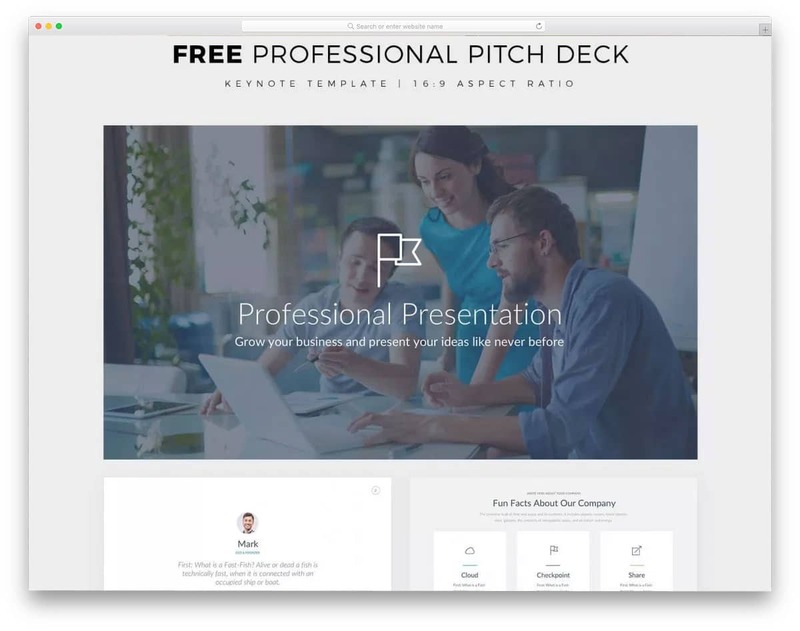 Free Business Presentation is a professional keynote template, you can use this template in any business meetings and even in conferences. With the simple clean design, this template gives equal importance to both image and texts so that you can explain the contents more interactively to the users. To match the simple design of the template, the line icons are used. Different colors are used for charts and icons to help you easily differentiate and show a different set of data. This keynote template is also from the creators of Simple minimal template mentioned above, so you can expect the same quality design with this template as well. 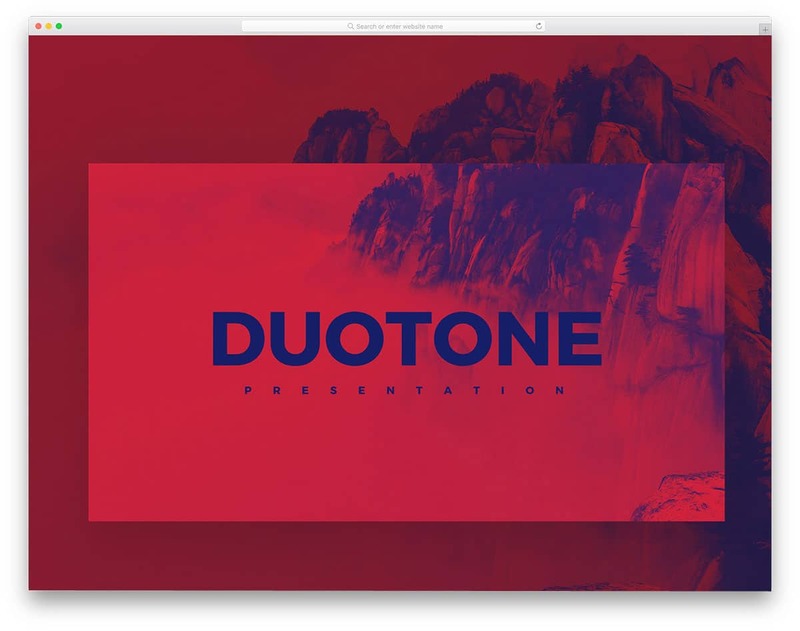 Duotone, as the name implies it is a duotone color scheme keynote templates. Experts shares that the Duotone is one of the extensively used modern web design formats. If you are a modern creative agency or photography studio, you will find this free keynote template interesting and also useful for your presentation. All the slides included in this template has 16:9 layout size, so you have more than enough space to add all your contents and elements. As a package, this template gives you 18+ unique slide layouts. 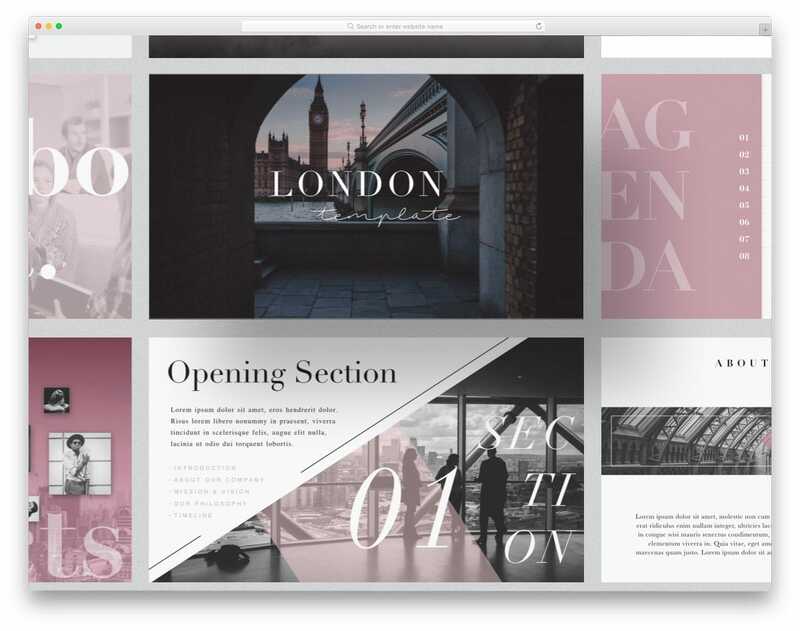 London is a lifestyle based creative keynote template. If you are looking for a modern template for your fashion event presentation, then this template for you. This template gives you a countless number of premade slides and 230+ free vectors as a package. So you can create any number of slides in no time with the London keynote template. All the slides follow simple minimal design, to give this template unique touch creative elements are used. The texts and the elements are bigger enough to read. The vectors given in this package almost covers all the elements you would normally require. 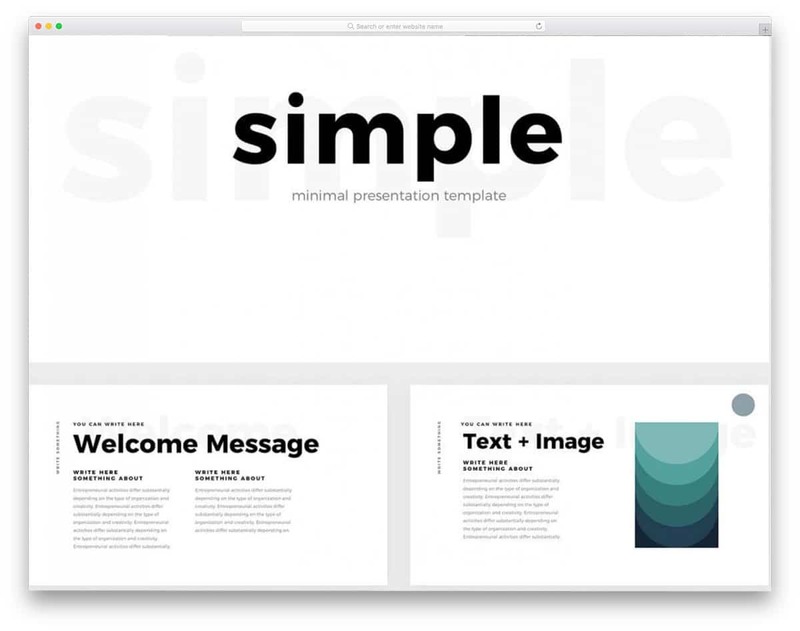 Basics are one of the best free keynote templates that gives you minimal design templates. 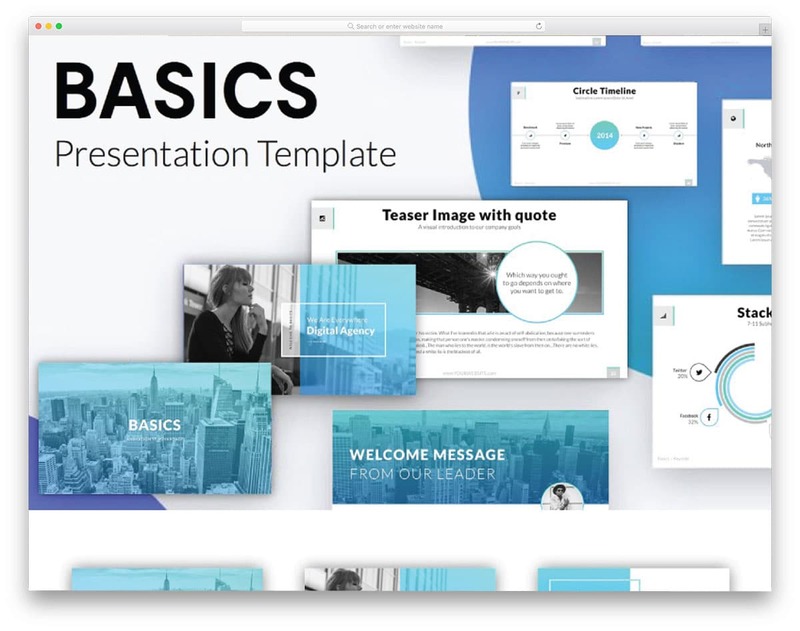 With more than 31 unique slide layouts you get more options to create a presentation in no time. As a package, this template also gives you free fonts and customizable shape elements. All you have to do is to add your contents and create slides for your presentation. 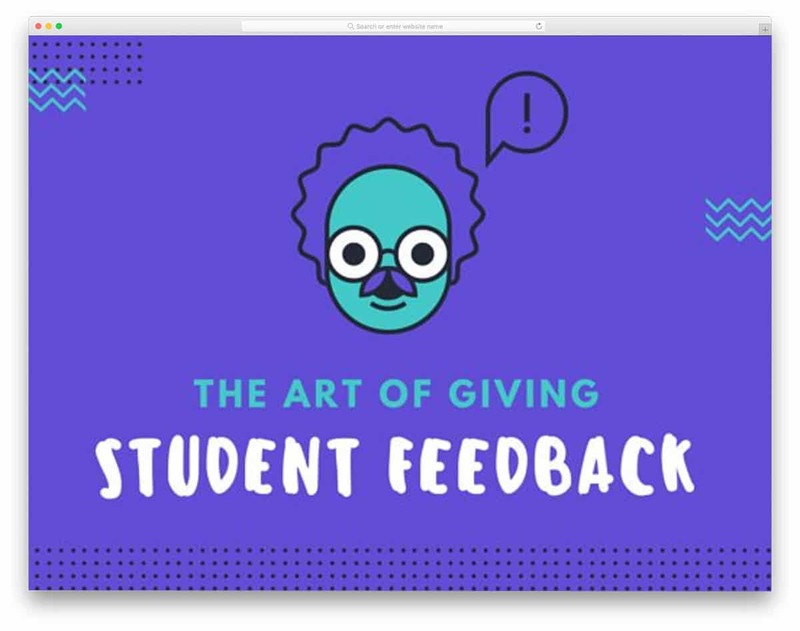 Art of student is a modern looking creative keynote template. If you are looking for a keynote that looks like the Google i/o events, then this is the template for you. Instead of giving you same old patterns, the designer of this template gave you different shape patterns. The use of trendy colors not only looks cool but also gives a lively feel to the template. With this keynote template you get five pre-designed slides, each of them have little bit design changes to avoid the same pattern. The icons used in the template matches the overall design of the template. 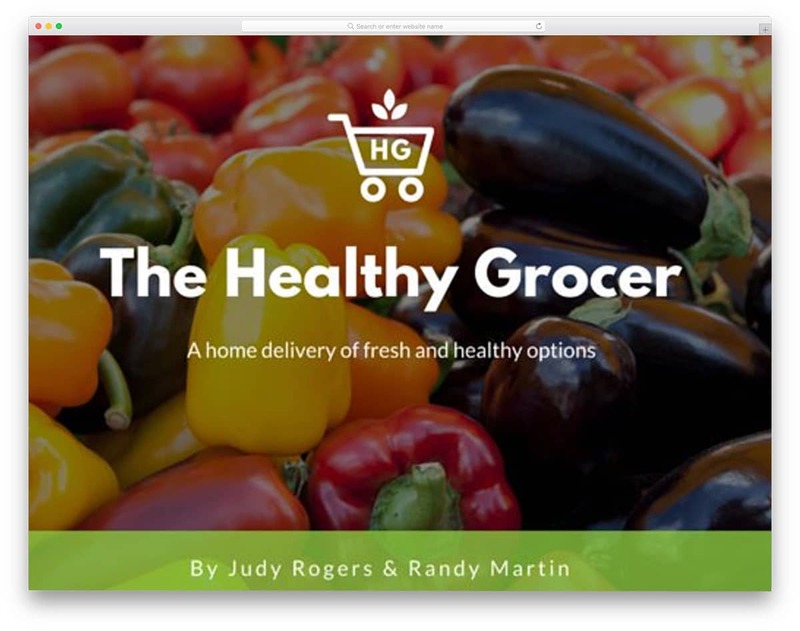 Healthy food, as the name implies it is keynote template for food-related industries like restaurants and grocery stores. This template is a combined mixture of photography and vector design. The designer of this template has balanced the images and vectors smartly throughout the template. To give users better readability and also to make colorful vectors look more vibrant, a clean simple background is used. The texts are bold and big enough to read so that the audience can read the texts without any difficulties. 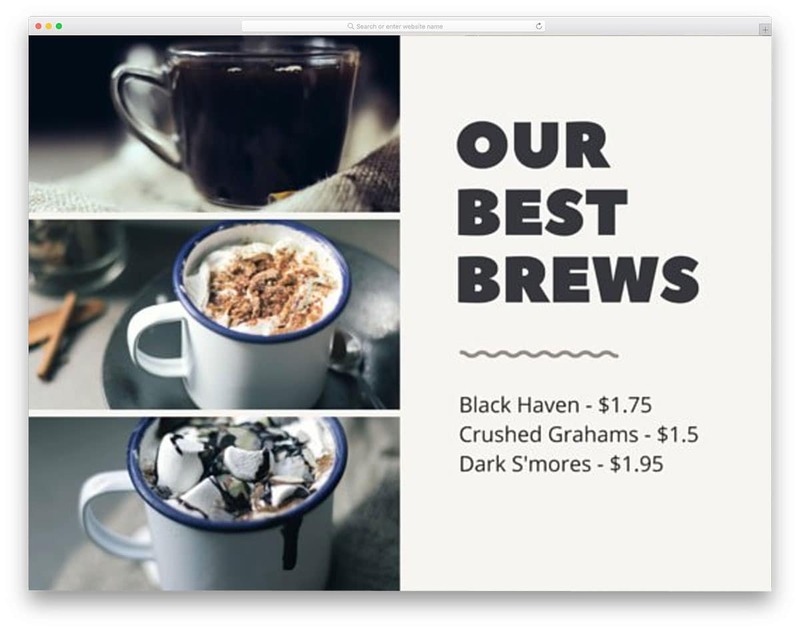 Right from fonts to colors, using the Canva tool you can easily customize almost everything in this template. 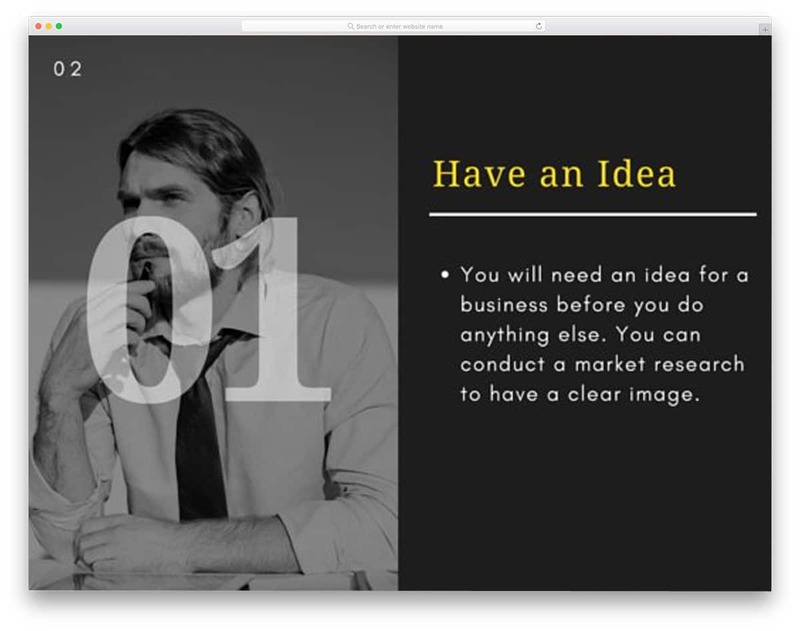 Black and Yellow is a creative template for business presentation purpose, especially startups can use this template to explain their services and product. As the name implies this template core theme revolves around the black and yellow color scheme. The beauty of this contrasting color scheme is you can easily highlight the important points with elegance. 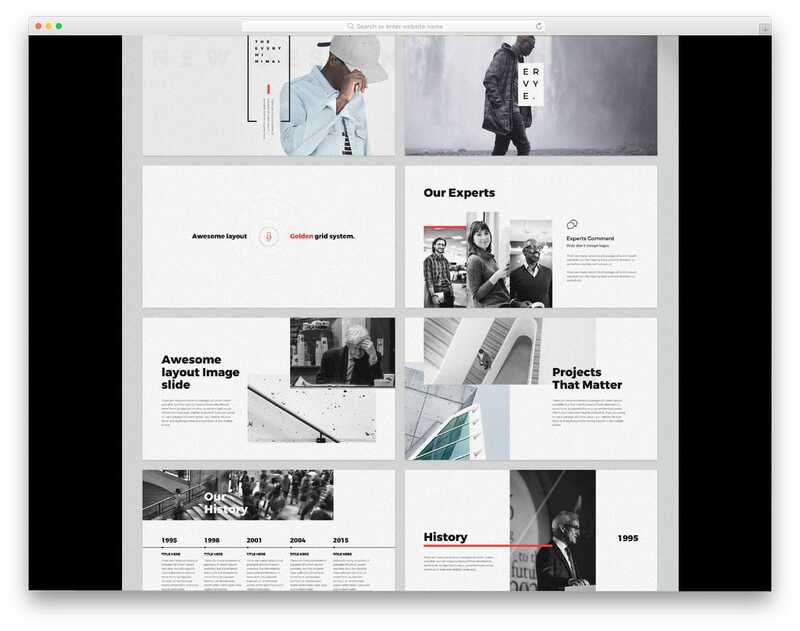 Since this template is designed for business purpose, split screen design is used to help you explain your business with images and texts side by side. To match the dark theme of this template the images used are in the black and white format, but the color images also look great on this dark color scheme template. 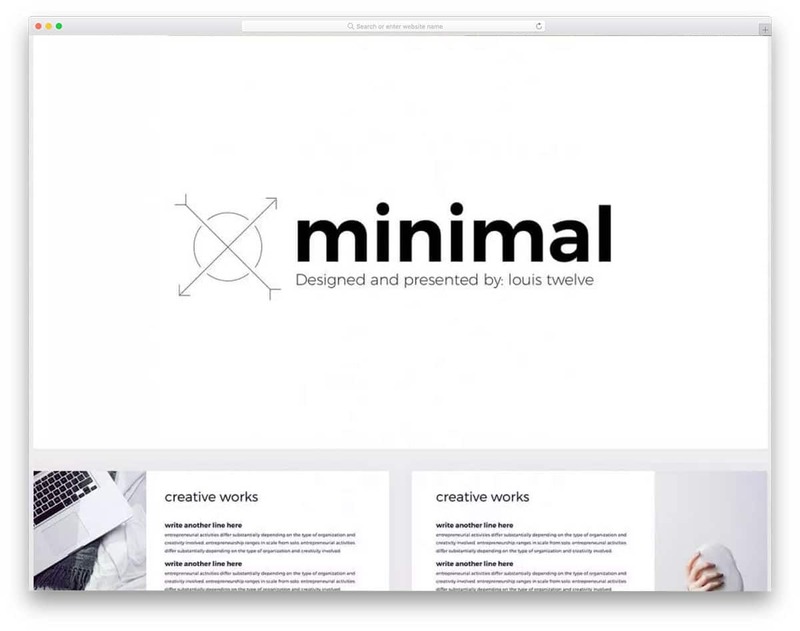 If you are minimalism lover, this simple template will definitely make you fall in love. Like most other minimal templates, this one also uses only clean white and ink black color scheme. The major advantage of the minimal template is you can manage contents easily, you need not worry about balancing the colors. This content focused template uses trendy fonts to match the taste of the modern day audience. The designer of this template has smartly handled both the images and the texts throughout the template. The only small bummer of this template is you get just three premade slides, which is quite annoying for productive users. Geometric Church, from the name itself you can clearly understand that this template is designed for churches. But the default layout of the slides is flexible enough to match any business needs. Just like the black and yellow template mentioned above, this template also uses the same color scheme, but this template uses the yellow color predominantly than the black color. To make the template distinct from other templates, it uses geometric shapes. Font selection is also awesome on this template, which matches the overall design and theme of this template. 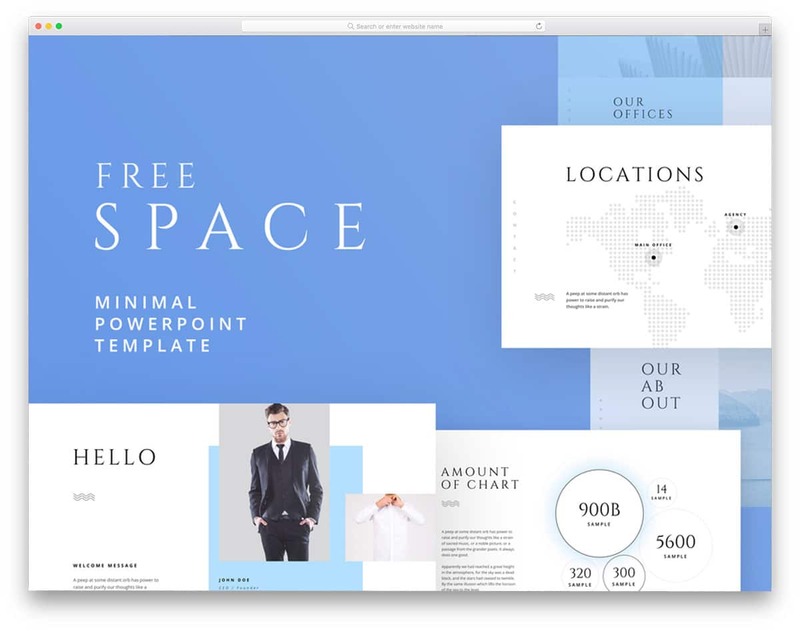 With this free keynote template, you get ten pre-designed slides. 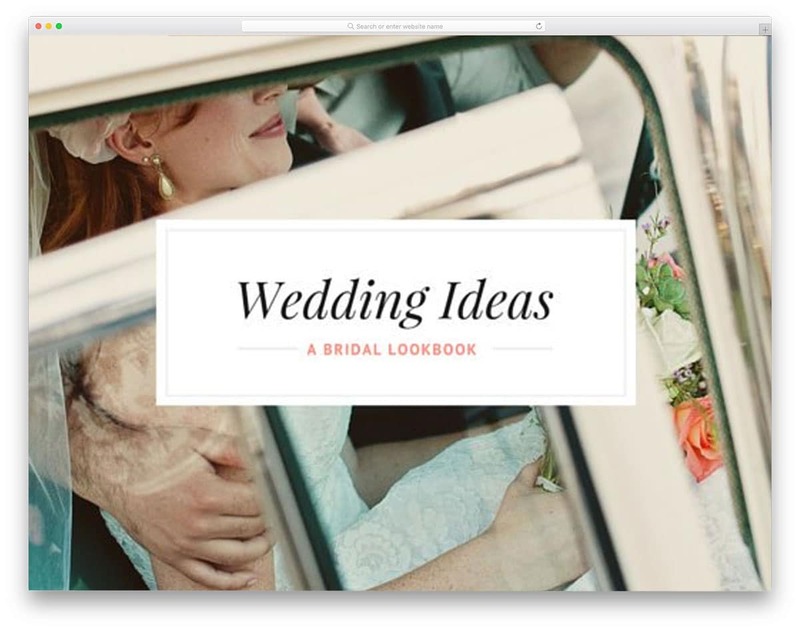 Wedding Ideas is the best keynote presentation template for wedding organizer and other event-related businesses. This template also uses minimal theme just like the Monochromatic template mentioned above, but this template uses different colors in its design. On the clean white background, the images and the texts look amazing and are also legible. To match the event theme of this template, more casual and handwritten fonts are used, which gives a more natural look to the template. With this template you get five pre-made slides, all five uses different design patterns to match all types of presentation needs. 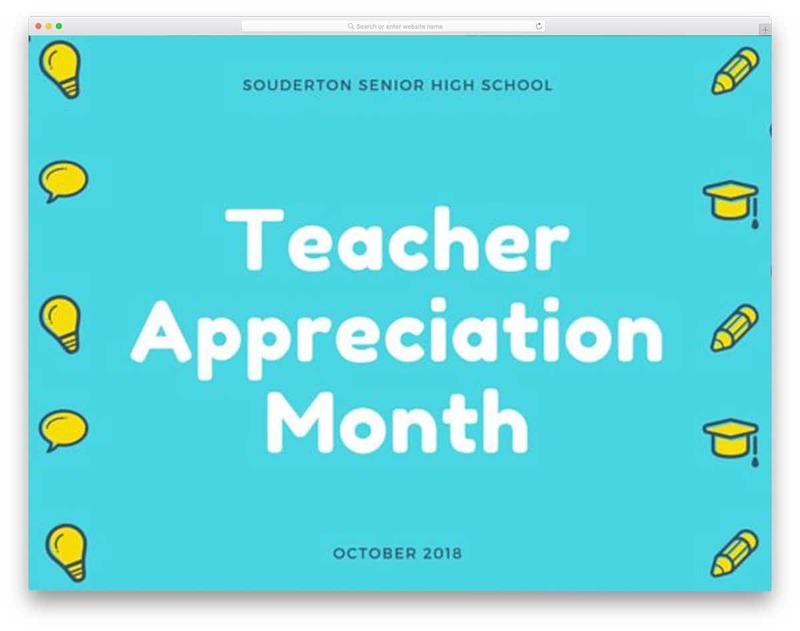 Teacher is a modern looking creative keynote template for schools. Since the core theme of this template revolves around children, colorful slides are made with more cartoon style icons. This template predominantly uses two color schemes, yellow and blue. For business, the default color scheme is not advisable but for presentation related to children will find this template extremely useful. The fonts used are also bold and casual that fits the children taste. This template is designed using Canva tool, hence customizing the template will be a matter of second job. In all the slider you have footer section, which you can use to improve your brand visibility in your presentation.